Death is part of wider federal inquiry of terror recruiting by Somali group in U.S.
MINNEAPOLIS, Minnesota (CNN) -- Abayte Ahmed and her husband learned of their son's death in the most heinous fashion. A family acquaintance called and told them to click on an Internet site. There on the screen were photographs of their 20-year-old son -- the boy with the movie-star looks -- shot through the head thousands of miles away in Somalia. Jamal Bana died in Somalia. Several missing Somali-Americans are believed to have fought there. "He must have been somewhat disillusioned and indoctrinated, because he didn't have any clue about Somalia at all," his mother said, fighting back tears and barely able to speak about her eldest son. Jamal Bana had been missing for months from his Minneapolis home. His family is still grappling with the circumstances surrounding his death in a land they had fled -- an African nation wracked by chaos and violence. Bana was the kind of son a modest immigrant family pins its hopes on. He was the eldest of seven and studying engineering at local colleges. But last fall, his family said, he disappeared without any warning. A few days later, the phone rang. All that could be heard was a quick sentence. "I'm in Somalia," his mother quoted him as saying. He then hung up. Communication from then on was scarce. In calls or text messages, the family said, Bana was guarded, as though someone was watching or listening to him. On July 11, the family received the call telling them to look on the Internet. Bana's father broke down in tears when he saw the photos. One image was a close-up of his son's face, a bullet wound on one side of his head. Another showed the body being carried through the streets of Mogadishu on a stretcher. His parents said they believe their son was brainwashed and recruited to fight in the civil war between Somalia's unstable transitional government and Al-Shabaab. Al-Shabaab remains entrenched in northeast Somalia and in sections south of Somalia's capital, Mogadishu, after fighting that has uprooted more than 200,000 people since early May, according to the United Nations. The question immigrants in the United States want answered is: How have their youth ended up so far away? One of the missing youth, Shirwa Ahmed, 27, blew up himself and 29 others last fall in Somalia in what is believed to be the first suicide bombing carried out by a naturalized U.S. citizen. Ahmed had traveled from Minneapolis. The attack raised red flags throughout the U.S. intelligence community and sparked an investigation by the FBI. Just weeks ago, community activist Abdirizak Bihi lost his 17-year-old nephew, Burhan Hassan, in Somalia. Asked if his nephew had been kidnapped from Minneapolis, Bihi said, "They kidnap them in the sense of mental kidnapping, not physically. But they play a male role of mentor." Bihi and community leader Omar Jamal said they hold one place at least loosely responsible: the Abubakar as-Saddique Islamic Center, the largest mosque in Minneapolis. "All these kids missing, they all have one thing in common: They all participated in youth programs in that mosque," said Jamal. Jamal and Bihi said leaders of the mosque, at the very least, allowed people to come around their facility and recruit young men to fight in Somalia -- a charge the head imam denies. CNN was not allowed inside the mosque, but was granted an interview with the imam at a different location. "This is the baseless accusation really," said Sheikh Abdirahman Sheikh Omar Ahmed. "The mosque -- the mission of the mosque -- is to worship. And people come to worship and go. We don't have any control over what comes through everybody's mind or ideology." Family wants to know, who sent son to die? Sheikh Ahmed said at least two of the young men who died in Somalia did worship at his mosque. But he said no recruiters came around the mosque to pull them away, and said his mosque does not support Al-Shabaab. He added that he has encouraged local families to keep their young sons from going to Somalia. Federal authorities recently made their first arrests in the case, charging two Minnesota men, Salah Osman Ahmed and Abdifatah Yusuf Isse, with one count each of providing material support to terrorists and conspiracy to kill, kidnap, maim or injure people overseas, according to the indictment. 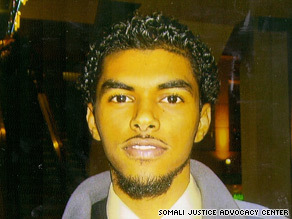 CNN could not reach Salah Osman Ahmed's attorney for comment. Published reports indicate he planned to plead not guilty. Isse has pleaded guilty and is cooperating with federal authorities, officials said. In court papers obtained by CNN, Isse's attorney said, "Mr. Isse will not be the last defendant indicted." A local attorney involved in the case said at least seven Somali-Americans have been questioned by a grand jury. An FBI official said the bureau cannot rule out the possibility that some of the young men involved could be trained to carry out terrorist attacks on U.S. soil. Meanwhile, CNN has learned more about how Shirwa Ahmed and Burhan Hassan made their way overseas. A travel agent in Minneapolis, who spoke on condition of anonymity, said the two men paid about $1,800 in cash for tickets to Nairobi, Kenya, or to Dubai, U.A.E. The travel agent said he thinks the two men then made their way to Mogadishu from those cities on a Somali carrier. For Bana's family, it's all too much to bear. Omar Boley is a close friend who grew up in the same tribe as Bana's family. He said Bana's mother is having difficulty coping with everything that has happened in recent months. "She doesn't want to hear the story again," he said. "She told me, 'Whenever I see someone talking about my son, I feel bad. I can't sleep. I feel sick. So this happened, nothing I can do. We pray for him.' That's what she said, and that's what I believe."